This information board on the Spanish Civil War is currently the center of much debate in Nottinghamshire. An information board dedicated to the 19 International Brigade volunteers from Nottinghamshire has spurred much debate between local Labour and Conservative politicians. 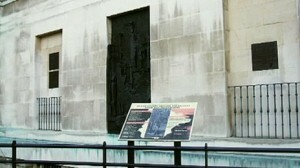 Alongside a plaque and a piece of artwork, this information board hung on County Hall was part of a memorial dedicated in 1993 to the local antifascist volunteers. 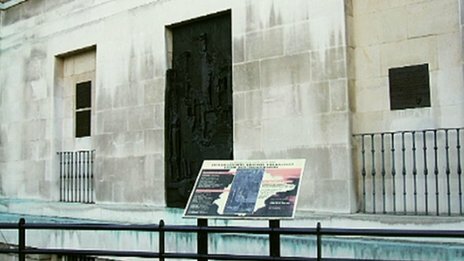 When Tory politicians gained control of Nottinghamshire County Council in 2009, they removed the board and replaced it with a general war memorial honoring all of Nottinghamshire’s war dead. Labour party members won the latest set of elections and local leader Alan Rhodes has promised to rehang the board outside Council Hall in the face of great Conservative outrage. she would be “very offended” by Labour’s actions if she were the family of Drummer Lee Rigby, who was murdered on the streets of Woolwich last week. Mr Rhodes said: “To use a terrible issue like that in an argument over something like this is outrageous.